Height: maximum operational height 3.41 feet. - Portable, Lightweight and flexible. Work very well, feel comfortable. - Unique mirror design, self timer and more comfortable. - Material rugged, micro-single phone DV machine in the above stability, is not worried. - Front & Internal Cameras record Quality Video, GPS Stamping & G-Sensor Feature evidence in case of accident/ incident disputes. We are recognized as one of the most leading and reliable distributors of reputed brands of Tripods. Our Camera Tripods are best in quality meet your exact requirements of standing cameras at shooting place. They can be arranged in your specified heights according to the requirement of shot. 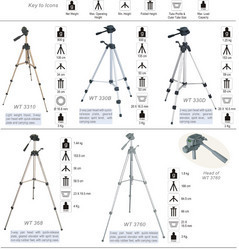 These Tripods are available at a very cost effective price best fitted to clients’ needs.